The HomeSenser is there to remind us about the cooking we have left unattended and to shut-off the stove if we don't return. 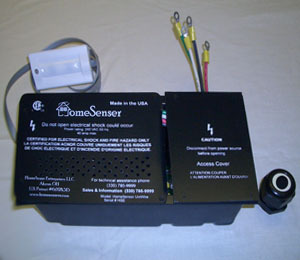 The CommonSenser - The CommonSenser can be used to automatically shut-off electric space heaters and other 110 volt appliances (toaster oven, coffe pot, curling iron) if left unattended too long. People over the age of 85 die in fires at a rate five times higher than the rest of the population. Cooking accidents are the leading cause of fire related injuries for older Americans. Most kitchen fires occur because food is left unattended on the stove and in the oven. The kitchen is one of the most active and potentially dangerous rooms in the home. Noted data and reports found at this site are the copyrighted material of the original contributors and may not be redistributed or modified without their permission.